A true sailor knows that the ocean is not the enemy, it's all the damn hard stuff that surrounds it. Coastal sailors get nervous when they lose sight of land. Ocean sailors get nervous when they approach land. 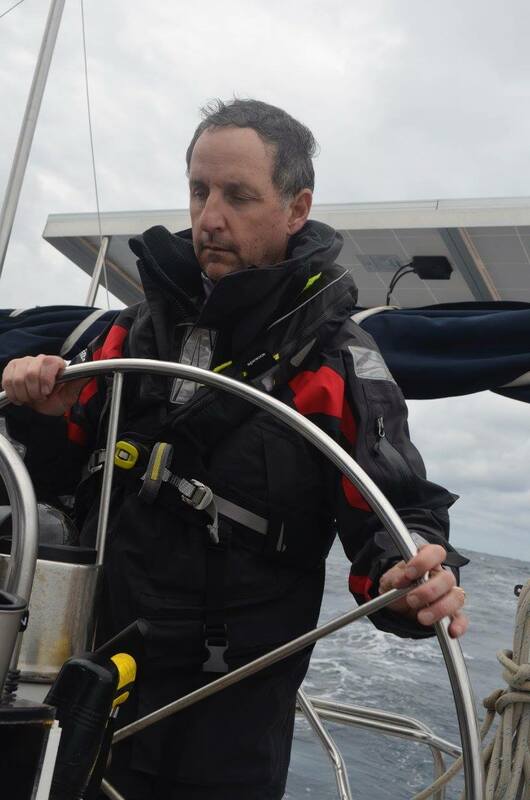 I am striving to appreciate, embrace, and respect both coastal and open ocean sailing. 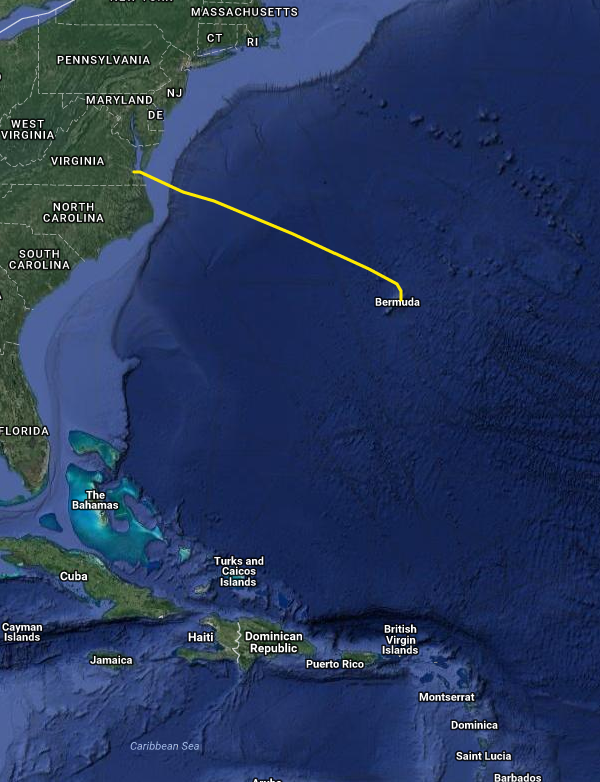 This simple little yellow line represents 650nm from Virginia to St. George Bermuda at approximately 115 degrees True. If we average 5.5kts we will arrive in about 120 hours / 5 days. 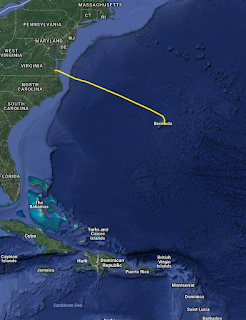 After 2 or 3 weeks in Bermuda we will head southward for another long (~850nm) passage to the Caribbean. The Gulf Stream is a powerful current in the Atlantic Ocean that originates in the Gulf of Mexico, flows in to the Atlantic at the southern tip of Florida, turns northward and accelerates along the eastern coast of the US up to Newfoundland. It is a large system of currents up to 4kts, sometimes forming circular eddies and creating powerful winds. The powerful, warm and swift current of the Gulf Stream follows the eastern coast of the US. It is akin to an enormous river roaring through the ocean. When the wind opposes the Gulf Stream current, the seas morph in to steep, cliff-like walls of water making crossing dangerous. Therefore, sailors seeks to find a weather window with winds generally in the same direction as the current. The Gulf Stream has a nasty reputation with sailors and mariners generally. Captains of small and large vessels respect her dominance, carefully consider how to use her power and avoid trying to fight her strength. As with all waters with current, it's best to avoid when the wind is opposing the current direction. For the Gulf Stream, this is especially true as an opposing wind here can cause very dangerous high and steep waves. 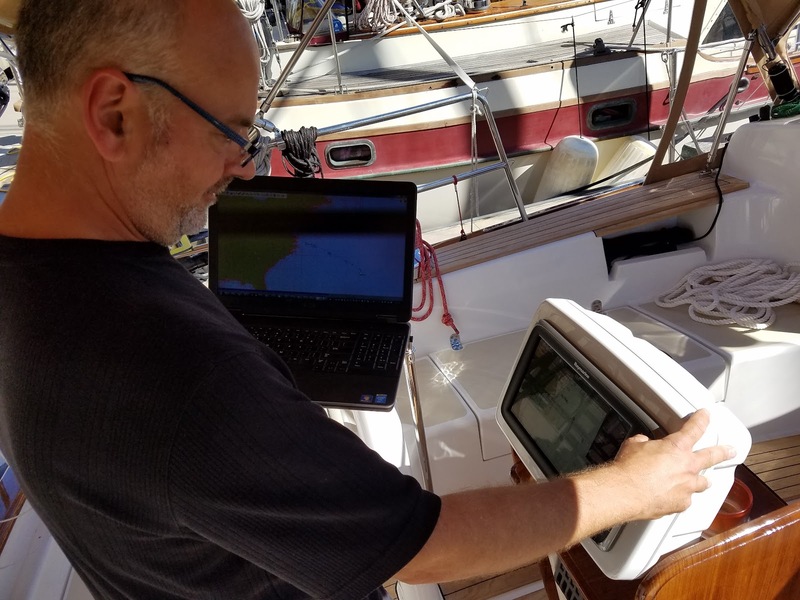 "... the sailing will be rather rigorous through the entire trip..."
With the help of our weather router, we will monitor both the wind and Gulf Stream forecasts to time our transit. In addition to wind and waves, there are various swirls and eddies in the Gulf Stream that need to be accounted for and may result in course adjustments. The part of the Gulf Stream where we will be crossing is about 75nm wide. After much examination of the weather information, discussion with our weather router, and talking through, we decided to depart the morning of Sunday 23 October estimating that we will average a robust 7kts and arrive in Bermuda midday Thursday 27 October. Winds are expected to be in the 15-30kt range during this time and the seas 4-10 feet. For nearly five days. I can do this. We will hit the gulf stream about 16 hours in to our trip (assuming a 7kt average, given the wind forecast). The strongest part of the gulf stream will come about 6 hours later and we should be clear of her extra waves and current in another 4-6 hours. Winds during this time are forecasted to be 20-25kts out of the west. Thus the first 24-36 hours of this journey may be the most difficult (Sunday night and Monday). A cold front will move through and pass us Monday evening but we will be well out of the Gulf Stream by this time. "Recommendation is to depart as planned tomorrow morning. The wind direction will be favorable the entire passage, and wind speeds and seas will be manageable, although above normal for the first couple of days leading to some rigorous sailing, including during the Gulf Stream crossing." Many blue water sailors have said that the long ocean passages are not the most dangerous part of sailing - it is entering and exiting the harbors that present the most risk. Ships and land don’t really like each other, and in the open ocean, there is little land to give you trouble. However, the mindset and attitude that is required to go far from land is quite different from staying along the coast and the consequences of being near land do not seem to require as much planning as the lifelines feel closer and stronger. Offshore the weather is amplified and self reliance is not a choice, it is a necessity; one must deal with all conditions and any challenges that present. Being out of sight of all land can instill a somewhat primal fear but also a rare escape. Busy harbors are fun, interesting, and usually protected but can be challenging to navigate, especially if unfamiliar. 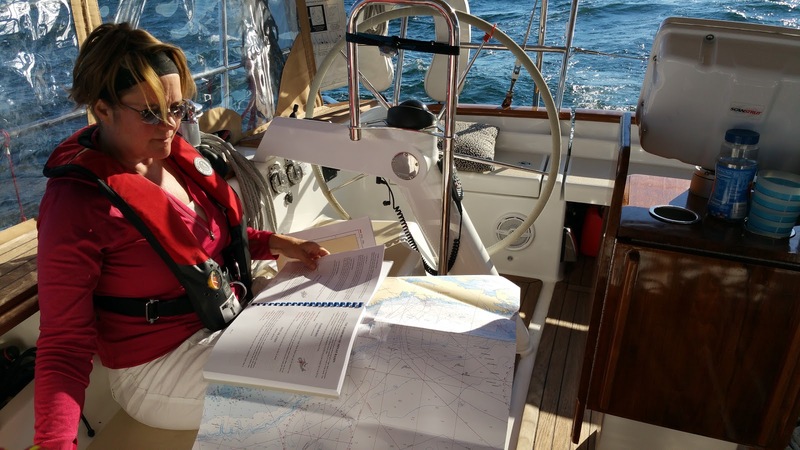 Coastal cruising can present all sorts of navigational considerations that do not exist in the open ocean: rocks, shallows, lobster pots, etc. One can feel much freedom on the open ocean. The seemingly endless ocean can be relaxing, inspiring, and daunting (and exhausting). Bob and I have done numerous overnight sails within 25nm of the coast feeling enchanted and intimidated moving through the darkness with the moon on solo watches. 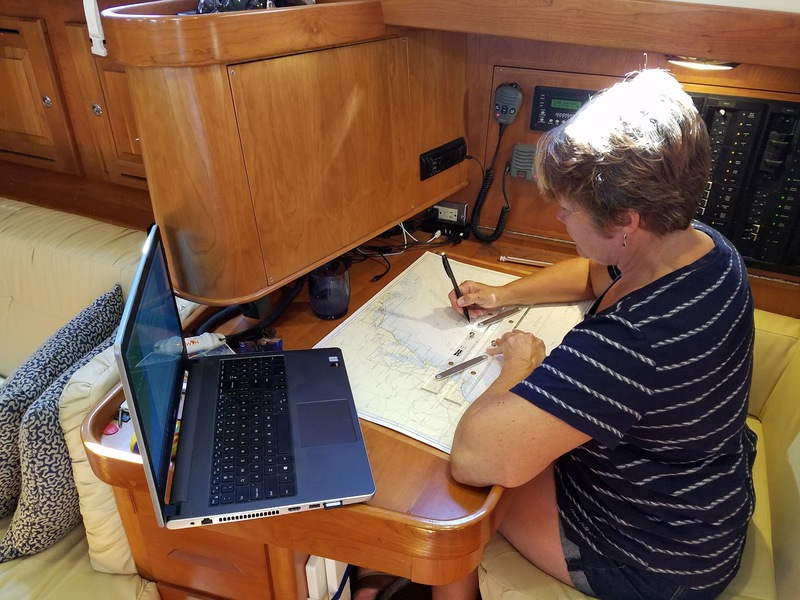 The long, lightless nights in various conditions have helped us prepare for extended offshore trips but we are both relative novices when it comes to blue water sailing with only a few offshore passages in our log. Sailing through a foggy night on a broad reach in rolling seas off the eastern coast of Nova Scotia. 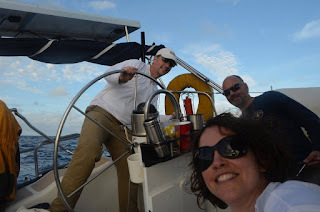 Bob crewing on Acedia - a Freedom 38 - with Skipper/Owner Melissa and Mate Lance from Newport, Rhode Island to Bermuda November 2015. Bob has one passage to Bermuda under his belt which is one more than I have. First light far from land. 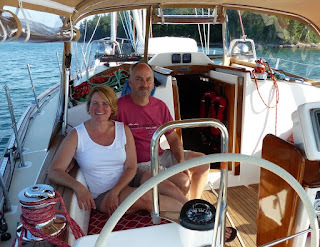 In preparation for the our upcoming much longer open ocean journeys, Bob and I have done several shorter offshore passages this past summer including Boston to Nova Scotia, Nova Scotia to Maine, and Block Island to Cape May. 100nm offshore between Boston and Nova Scotia. The water really is blue out away from land. This recent trip to Nova Scotia was a practice offshore for me, Bob, and Argon. Generous following waves made for a challenging long day of sailing off the coast of Nova Scotia back in July. Even though we have had a prepared boat for a while, there is a flurry of activity needed in the immediate couple of days prior to departure. We learned yesterday (Thursday) that our likely departure will be early Sunday morning (just a day after posting this blog entry) and have been very busy with final activities. 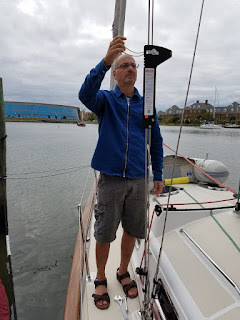 Check and fine tuning of the standing rigging. 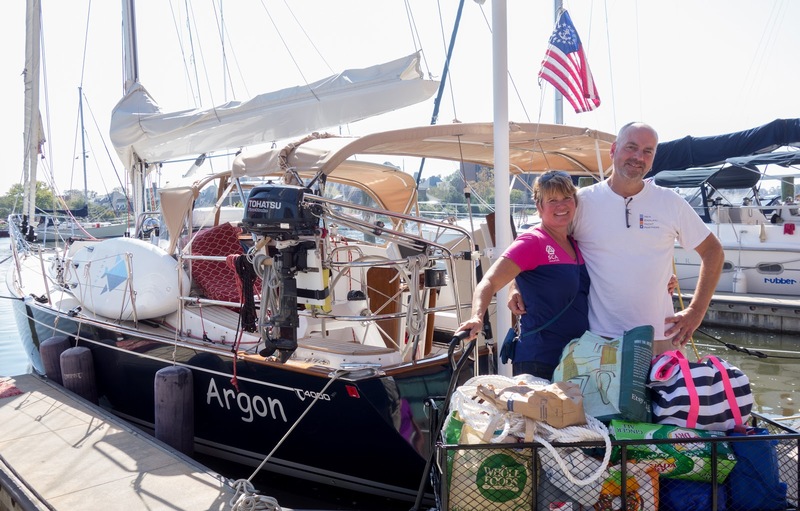 Former land neighbors, Ricky and Donna, from our neighborhood outside of Boston happen to be in the area preparing for their own sailing trip south. 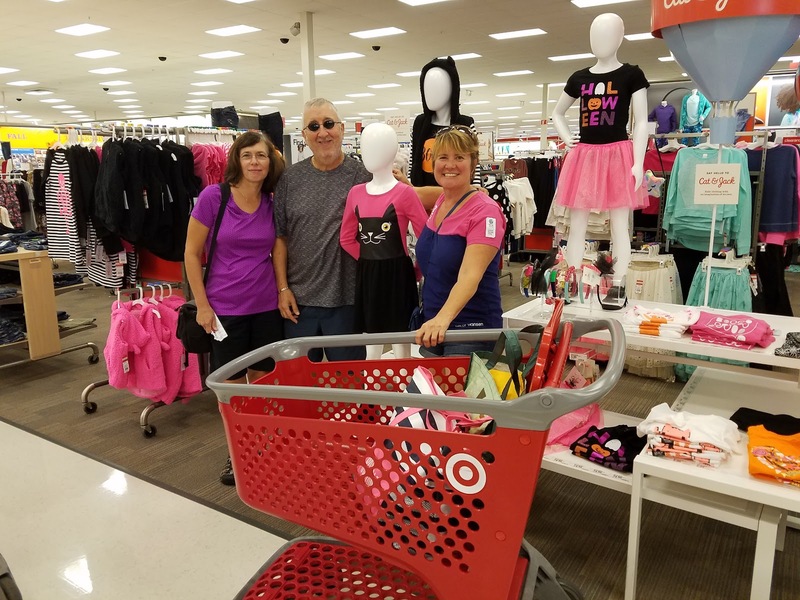 They were kind enough to cart me around with them on provisioning runs to Target, West Marine, propane refill, and the grocery store. Huge cart full of groceries and staples to stock up on both near and long term needs. Bermuda and our future destination in the Caribbean can have scarce availability of some items and high prices so we stocked up on various non-perishables and stored them creatively on the boat. Bob attaching mounting straps to the ceiling of the aft cabin to secure our fishing rods out of the way. 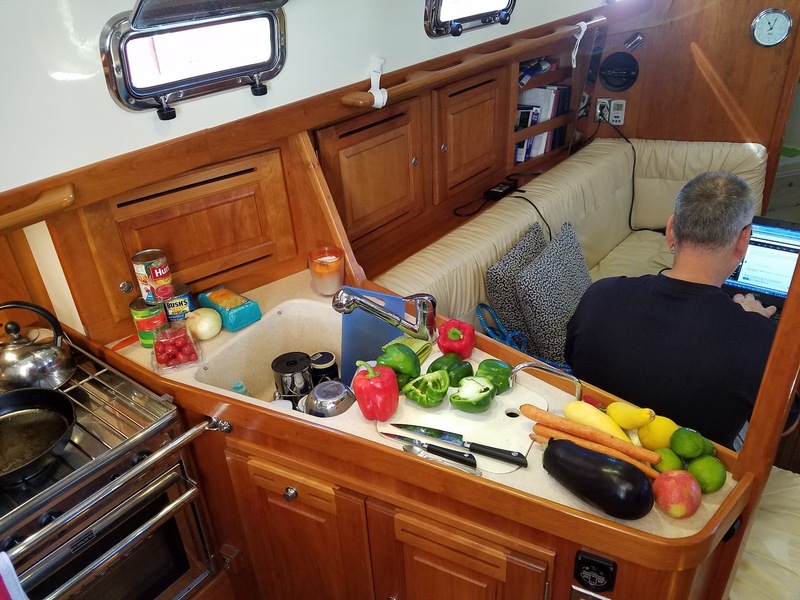 The aft cabin will store Bob's instruments and music gear as well as spare groceries, dinghy bench/oars, stand up paddle board, and the storm sail. 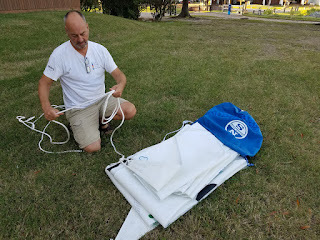 Repacked the storm sail for easier access (but we hope to not need it! ); see video above. Front loading the food preparations: Offshore menu will include stuffed peppers, lentil pasta, risotto, roasted veggies with wild rice, and broccoli with wheat pasta (all with less spice than I would normally use to go easy on our bellies). Also on hand will be bland crackers, seltzer water, ginger ale. nuts, steel cut oatmeal, and energy bars. Bob gets his last bit of Atlas work done as he will be completely off line all next week. Programming course waypoints in to the GPS to help us track our actual course against our expected course. Plotting waypoints manually on a paper chart. The watch captain will update the chart with our actual latitude and longitude at the end of each shift. In addition, we ran and checked the engine, secured the extra diesel tank, organized the aft cabin, performed a thorough safety check of the deck and all rigging, and secured all items down below in the cabin. Bob will also get a last surge of work for Atlas in as we will be off line all next week. We welcome a good friend and top notch sailor, Lance Ryley. 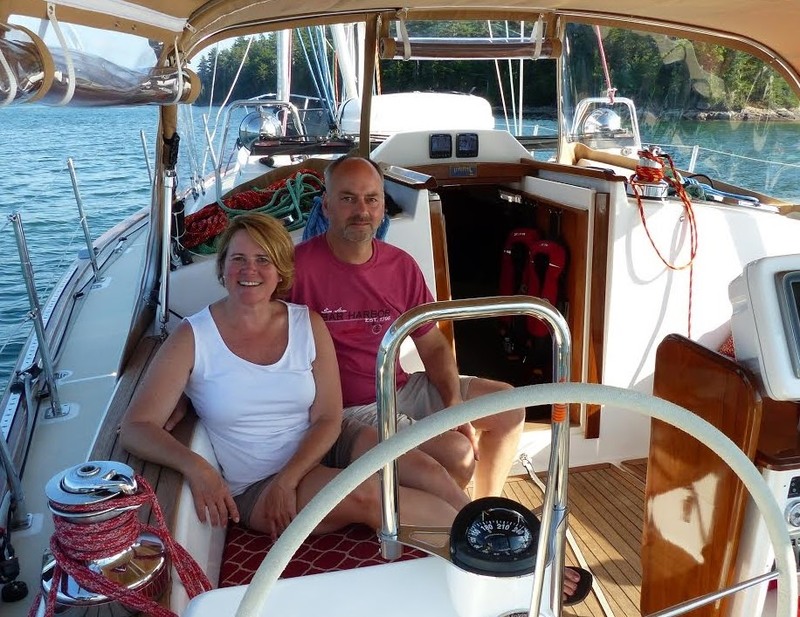 Lance owns several boats including a sweet and very fast Columbia 32, Rocket 2.0. Lance has quite a reputation in the New England racing community as an astute racer and we are thrilled that he is going to step away from his full life in Boston to crew on Argon with us to Bermuda! Bob and Lance co-crewed on Acedia - a Freedom 38 in November 2015 on a delivery from Newport to Bermuda. They still like each other. We are thrilled to have Lance join us en route to Bermuda. Given that we are fortunate to have an additional crew person (thank you again, Lance!!) our normal 3 on 3 off watch schedule can be modified to 3 on 6 off... so much better. The on times mean constant helming, trimming and making sail changes as needed, staying alert for changing conditions, traffic or debris, signs of issues with the boat, and manually plotting our position at the end of each shift. The off times should be spent resting and sleeping so one has stamina for the often tiring and intense on times. But off times also may include downloading and examining most recent weather forecast, cooking, showering, and helping the on helmsman if conditions warrant another set of hands especially when winds are high and/or seas are rough. In addition, given the conditions expected on the front end of the trip, the watch schedule may be modified to have two of us in the cockpit the first 24 to 36 hours which would mean potentially a 6 on 3 off schedule for the first day and a half. Night watch en route to Nova Scotia in July (temperatures at night normally drop quite a bit). We expect the first couple of nights en route to Bermuda to be quite cold. Yes, I am excited. And, yes, I am nervous. It is daunting. So much preparation, planning, and practicing. Now it is game time. We will update our position every several hours with a quick satellite upload. You can check out our position right here in the blog as always. Please send us good thoughts! I am looking forward to experiencing this offshore journey, tackling the challenges, and feeling a sense of accomplishment on the other side. And... two of our three boys will be visiting us in Bermuda - yeah!! After a couple week hiatus in Bermuda, it will be on to the Caribbean! Until next time, from Bermuda... We AReGONe!! Great Post! Will be following your progress on the way to Bermuda! Thank you, Dan. You and Allyson were an inspriration to us!